Had a really good start to the week, met up with new friends in Brockweir and old friends at the Spinning Weal and got an awful lot of spinning done. 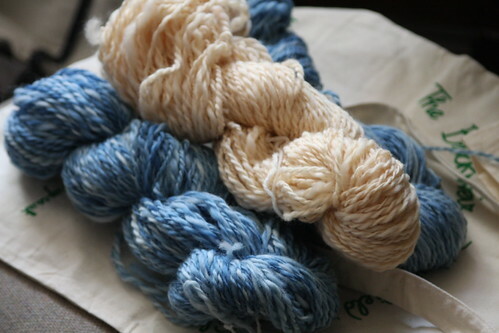 (Indigo 3rd Dye Bath and Alkanet 3rd Exhaust bath – Merino wool). Not particularly tidy spinning or even, but just how I love it rustic and bouncy….! Hand-dyed and handspun yarn. The more I am weaving it, the more it is reminding me of Shabby French Chic. Definitely need to change the name from Daisy Daffodil, the original colourway. 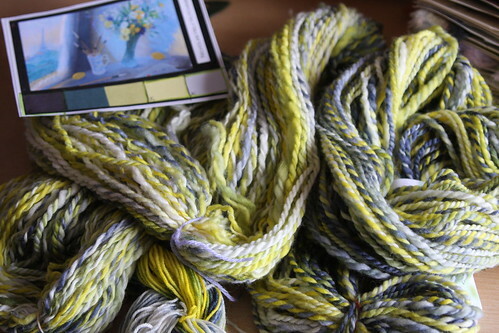 I love the vibrant spring colours , they are acid dyed, black and yellow kemtex, with a smattering of spring yellow from Tall Yarns. I have just died some Weld this morning and the yellow is very similar. 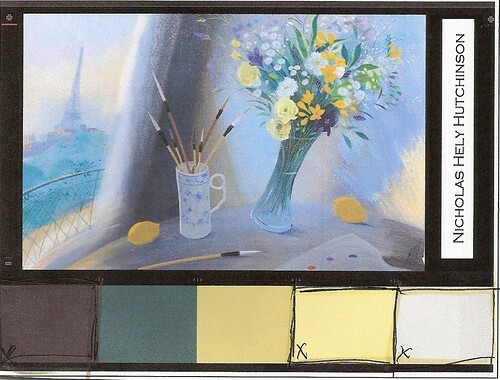 The inspiration for the colours came from a picture of a Table arrangement by Nicholas Hely Hutchinson. The reproduction I had though was far less blue, and more mauve. SHABBY CHIC - a look reflecting casual and relaxed lifestyles. Emphasis is on a soft touch, neutral colors and often a puckered, washed or unfinished look. 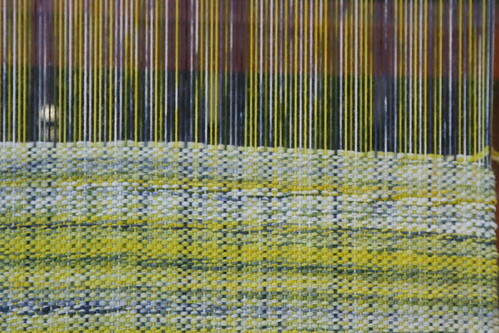 I suppose in some ways it is – but I love the way the weaving is very rustic and naive, as the wool was loosely spun to try to keep the energy of the colours in the handle and balance of the fabric. reminds me a bit of a coat my mum had – along with a matching basket - all very french rustic farmhouse stuff. So I think I shall probably settle for French Shabby Chic! 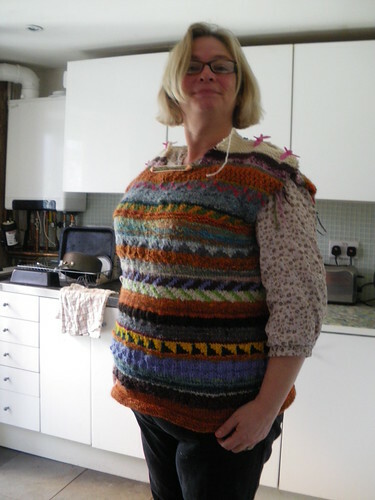 I hope she doesn’t mind me putting this on here… she looks glorious in it… and I have now nearly finished one sleeve.. Were you at the Spinning Weal on Monday? Steve and I should have been there, but we forgot! So much going on in the family! Steve has taken his wheel and spun there once before.I like to knit, I leave the spinning to him. 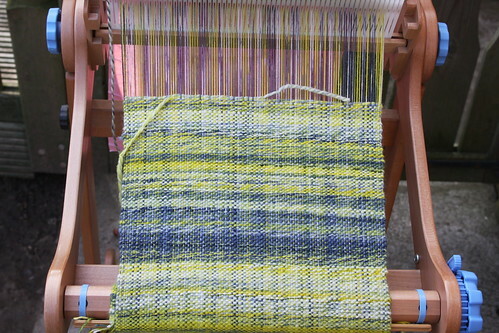 I love the colours you have dyed for weaving. 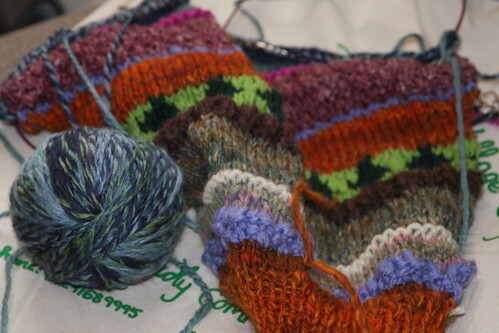 Your sweater reminds meof one I made for my eldest when she was little, I made mine to use up odds and ends. Yours looks much more intentional! Lovely!